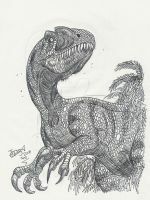 Nanshiungosaurus is known from a cervical series, a dorsal series, and the classic heavy ophistopubic pelvis that all Therizinosaurs seem to have. It's one of my favorite dinosaur names. 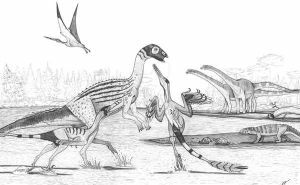 Since you seem to be a dinosaur expert, what makes nanshiungosaurus different from therizinosaurus because to me they look the same. Robust vertebrae. And size in comparison to the others. But, there isn't much of a way to tell how different they were, as remains are very scarce for this group of dinosaurs. so many therizinosaurs, are they your favorite species? I just wanna do their whole family. There aren't that many of them. After I'm done with these, I'll continue with other theropoda, mainly those basal coelurosaurians that led into the Tyrannosaur family, and some Allosaurids, with some other types of dinosaurs in between. Basal? What do you mean? Basal as in more primitive and closer to the early ones. I like your therizinosaur collection. they are all pretty acurate.